He is petty, lacks ideas and beat up his ex-girlfriend. Why is he running? Joel Young was the first candidate for Assembly to reach out to me last year Until then, I hadn’t really thought much about who was running. I didn’t know anything about Young, so I did what I’d do before meeting anyone: I googled him. Young can only hope that voters don’t take that step. If they do, they will come across story after story about Young’s “altercation” with a former girlfriend, one that left her with injuries to her face and neck deemed consistent with domestic violence. The story is pretty sordid. The woman walked into Young’s apartment and found him in bed with another woman. She yelled and slapped him. She says he responded by slapping her forcefully and cranking her head on the bed repeatedly. He says it was self-defense. According to a sworn statement by the emergency room physician’s assistant who saw her, her injuries were consistent with domestic violence and not self-defense. Young is a former football player, his ex-girlfriend is 5’2″ and weighs 120 lbs. When Mike and I met with Young, the story about the extent of her injuries had not yet appeared. At that point I was prone to see it as a “he said/she said” sort of thing. I was willing to give Young the benefit of the doubt, and focus on his merits as an Assembly candidate. I was not impressed. The first issue had to do with his platform, at the time it was: jobs, education and the environment. The problem is that that’s everyone’s platform and Young had nothing original to say about those issues, no new solutions to offer. It sounded to me like these were issues he’d chosen for their appeal to voters and he was reciting a script when talking about them. I didn’t feel he had any passion for them, or really, for anything, perhaps other than getting elected. This impression was solidified at a recent candidates’ forum where Young answered almost every question by repeating the mantra “jobs, jobs, jobs” – but never once intimating how he would create more jobs in this economy. During our meeting, I brought up the issue of the domestic violence allegations. He was insistent that the woman in question had never been his girlfriend, just someone he casually dated and had broken up with. He said it was she who beat him, he was just covering himself against her attacks. Not having read about the hospital records, that seemed plausible. But then Young said her allegations were politically motivated – which made much less sense. I let Joel know that I am a human rights activist and that my biggest concern is about protecting civil liberties. This brought the conversation to the issue of freedom of expression and Joel’s conviction that we should do away with anonymity on the internet. You see, the story about the domestic violence incident was “broken” by indybay and was not signed. Joel saw that as reason enough to do away with the first amendment protections on anonymous speech. I tried to convince him otherwise, explain to him the importance of anonymous speech, the risks that victims and whistleblowers experience if they are forced to reveal their identities. He didn’t get, he wouldn’t get it, what happened to him was the only thing that mattered. I’m sure that it will come as no surprise that I will not support someone who is willing to restrict freedom of speech. But I also will not support someone who will use his power as a legislator to protect his own interests, who puts pettiness ahead of public policy, who see himself as more important than the people he represents. I won’t support someone who has no principles. After the scandal, Joel Young lost the support of many of his backers. He was seen as the heir apparent of termed-out Assemblyman Sandré Swanson, but Swanson quickly distanced himself from Young. Kathy Neal, another prominent supporter, was so appalled by Young’s behavior that she almost threw her hat into the Assembly race. His prodigious fundraising, slowed down significantly. But Young still retains a lot of support from within the African American community and parts of Labor. Sharon Cornu, the former Secretary-Treasurer at the Alameda Labor Council, has been particularly effective in cajoling endorsements for Young from labor unions and activists. The issue of the scandal, moreover, has not yet come up in the campaign. Neither Bonta nor Guillen have brought it up in their literature – though surely they will if Young makes it past June. The media hasn’t put much of an emphasis on it – though Young’s most recent mishap, when he threatened and spat on a legislative aid, was covered briefly by the Oakland Tribune. Needless to say, I recommend that you do not vote for Joel Young. Rob Bonta and Abel Guillen are by far better choices, and my bet is that they also are much less likely to end up in jail. 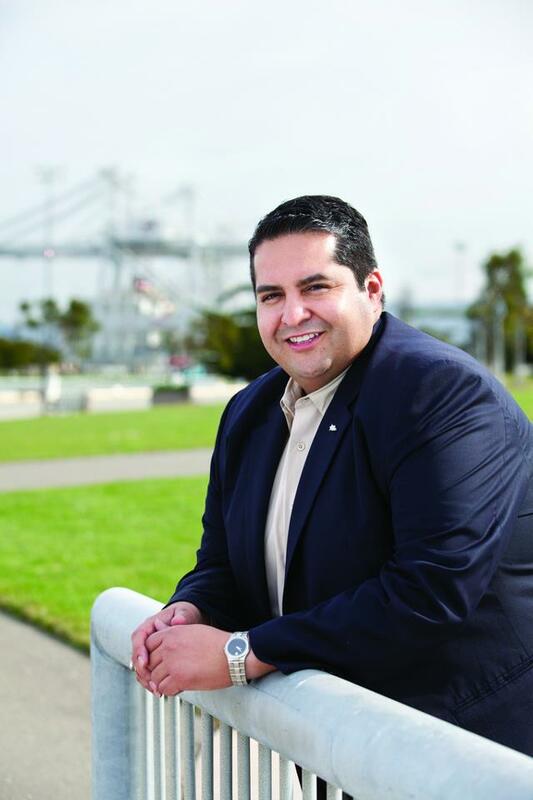 Abel Guillen has charisma, energy and optimism – but is he mature enough for Sacramento? When you meet Abel Guillen, and get past his physical presence (Abel is a big guy), you cannot but feel at ease with him. He is friendly, smart, empathetic – and real. The latter is something you don’t find often in politics: people who don’t hide themselves behind facades or carefully sculpted images. To use the Bush-age phrase, Abel is someone you’d definitely like to have a beer (and some nachos) with. I can’t really say the same thing about either of his opponents. Abel’s genuineness extends to his ideals and his agenda. He’d be your typical grass root progressive, if such thing existed any more. His belief in a more equitable society, in education as the “ticket out” of poverty, but also the cornerstone of a democracy, harkens to a time before the Democratic party lost its idealism and commitment to justice in all its forms. Abel wants to create a better California from the ground up. Education, healthcare and social services are essential; children who are malnourished, sick and uneducated will not only fail to accomplish their own potential as human beings, but might become a burden on society. The nurses and teachers support him because they see him as the most likely candidate to fight for these services – and I’d even say, the most likely candidate to fight for anything, period. Abel is a fighter, he is in his mid-thirties and has won quite a few battles, he still has hope. I had already endorsed Rob Bonta when Abel called last January and asked to meet with me. Abel had not answered my request for a meeting back in the Fall, when I was interviewing all the candidates. I’d figured, if a candidate doesn’t want to make an effort to meet with me, he doesn’t really want or deserve my endorsement. Plus I was a bit suspicious of Abel to begin with. The pictures of him on his website made him look arrogant; he is not married or has children, which for me is a big minus. Still, my friend Jim Prola kept telling me that Abel was the candidate for me, that he was the closest to my political beliefs and that I should meet him. So I did. His hope and optimism won me over. If you’ve been following my blog, you probably know that I have become disenchanted with politics, and the possibilities of real change. I the last six years, I worked on the campaigns of several School Board members, the Mayor and a council member, hoping that if we just had the right people in office they’d bring change. None of them did, it’s all more politics as usual with different suits. Nationally, things are even worse. I will admit that I never drank Obama’s kool-aid, but for a few moments I dared, perhaps, to hope. Then Obama made such a mockery of that word that I thought my hope would be buried forever. And now comes Abel and maybe, just maybe, he’s rekindling it. I think Abel has hope, I think he believes things can be better. He, himself, is the son of poor immigrants. His parents came from Mexico, his dad worked his way from a dishwasher to a pastry chef in a hotel, his mom became a cook. He grew up in the Mission and saw friends and acquaintances fall victim to violence, but he persevered, was lucky enough to get the right teachers and mentors, and went on to graduate from Berkeley. His goal, he told me, was to “do good, but also do well,” anything else would be a betrayal of his family and their dreams. I think that is exactly the philosophy we should instill on our children. Abel got a job with a financial company helping school districts pass bonds, it’s a good job, he does well, but by helping schools he’s also doing good. His work as a trustee at the Peralta Community Colleges board is yet another instance, he’s probably the most engaged trustee I’ve ever seen. I have high hopes for Abel if he gets elected to the Assembly. He has some very innovative ideas that he’ll be able to push directly. One that has my full heart support is that of creating a state bank. A bank that is not driven by profit could do much good and definitely much less bad than one that is. It would assure that any revenue was re-invested in the state, it would make it easier for small businesses to have access to credit and could help all consumers to not be taken in by ridiculous bank fees. I do hope that if Abel is not elected, whoever is will take this idea on. But it’s exactly this type of bold ideas that make me excited about Abel. I do, however, also have a couple of concerns. My main one has to do about how he’s ran his campaign. Not following up and meeting with me back in the fall was a basic mistake – whether I have any influence with voters through my blog is debatable, but as a member of the Alameda County Democratic Central Committee (ACDCC) I do get to vote on which candidates the party should endorse. But there have been many other mistakes – from not getting a good photographer to do his pictures (he still has that picture with his arrogant smirk on his website), to having badly designed mailers, to not following up with people who were willing to host events or do volunteer work for him, etc. etc. Just as problematic is the fact that his campaign manager, Winnie Anderson, decided to run for the ACDCC this June. Anderson was recruited to run by Ignacio De La Fuente, an Oakland City Council member who is trying to take over the party. I think any casual political observer would see how having your campaign manager take the side of someone who is trying to subvert the party, and have her run against some of your supporters (I, for example, am also running for re-election to the ACDCC) is not a good move. Indeed, it’s almost a guaranteed move to lose support within the party. I’m not personally bothered that Anderson is running against me, 19 people are running for 10 positions, but this shows such a lack of judgment by Abel that it makes me question whether he’s politically mature enough to go to the Assembly. All that said, the choice for me is really between Bonta and Guillen. I’ll be honest and tell you that I have yet not decided who I shall vote for. I think, however, that either is an excellent choice. Guillen and Bonta visit our mail boxes, but who makes the best impression? Just got my first mailer from Rob Bonta, after getting four or five from Abel J. Guillen. And for election junkies, here is my analysis 🙂 I’ll post pictures of the mailers after I scan them. Bonta made a bad move by 1) having his mailers delivered after Guillen’s and 2) having them be very similar colors. Guillen’s is more purplish, but they are too alike. That means that after so much stuff from Guillen, I almost didn’t look at Bonta’s and just assumed it was another piece from Guillen. Guillen gets brownie points for having gotten his first mailer out first, but loses them for having sent out so many in such a short period of time. Granted, one of them is not from his campaign but from the Nurses association, but it’s so similar in look to the other ones that you wouldn’t be able to tell. Four mailers make him look desperate and begin to make me wonder about his concern for the environment. I think I’m going to scream if I get another mailer from him with my absentee ballot! Guillen’s mailers wouldn’t be so annoying (and ineffective) if it wasn’t for the fact that they are too similar. Two of them (granted, one is a walking piece but it was dropped in my mailbox) feature the exact same photograph of him. Unfortunately, it’s not even a good photograph. It includes too much of his body and given that he’s a big guy, that takes some attention away from his face. Even worse is that the picture was taken in the sun so he’s squinting. When you are hoping that people trust you, it’s actually important to have them be able to see your eyes. But the similarity in the look of the mailers also implies a similarity in the message – so there is no incentive, even for an engaged voter, to look carefully at more than one of them, specially as they have nothing that visually grab you. And even bigger sin, however, is the fact that Abel’s mailers hide his name. The most important part of any campaign is to have voters remember your name (and hopefully in a good way). Expert say that they need to see your name at least five times for it to stick in their minds. That means that the first rule for a mailer is: have the name of the candidate prominently displayed on the first page. And that means that it should be in larger letters and a different font than anything else on the mailer. I truly don’t understand how Abel could have missed something so basic. (Now, this rule can be broken when you make a mailer so compelling that people actually turn the page and/or read it – but a mere picture of the candidate won’t accomplish that). I wish I didn’t have anything more to criticize, but Abel’s mailers also need to be faulted for their design and content. Abel’s first mailer was an 8 1/2 by 11, double page affair. Inside it had two photographs (including one of just himself, squiting, again) and so much text, in so many different fonts and so many different sections of the page (10 in addition to his logo) that makes it too busy and a nightmare to read. Indeed, I had to force myself to read it, and couldn’t even do it on my first try. I just wanted to close my eyes and run away from it. His second double-paged mailer was slightly better. It has a nice picture of a beautiful African-American professor (the race matters here, as Abel is trying to show that he has support from all demographics), but the name issue remains. While the text inside is better organized (less prone to give me a headache), there is way too much of it. He has four paragraphs about himself and five points on his accomplishments, plus a quote from a newspaper. Again, I love Abel but even I will not read so much stuff. The two postcards I’ve gotten from him are better in that they at least have less text but he seems to be unaware of the rule that 1) you should have only three items per mailer (that’s as much as a reader is willing to look at and remember) and 2) you shouldn’t have long paragraphs. Candidates should remember that people get their mailers along with their mail – which means they are flipping through it and unless for some reason they grab them, they won’t do much more than glance at them. And that may actually be a good thing – for the content on Guillen’s mailers is also repetitious. He mostly talks about what he has accomplished in the Peralta Board, which would be great if he was running for re-election, but he’s running for Assembly. If he’s going to talk about accomplishments, he needs to explicitly divorce at least some of them from the Board. Now, I’ve only received that one postcard from Rob Bonta, so it may not be fair to compare him to Guillen yet. After all, his mailers to be may be just atrocious. But Bonta does several things right on this postcard. First of all, his name is prominent on both sides of the postcard. It’s in the style of his lawn sign (assuming he has one), which I wonder if is a trend our graphic designer started in Mike’s campaign or existed before that. I might have liked the sign to be a bit larger, though. Bonta should remember older people vote more and some of us can see less and less. I also wish the picture of hims with his family – all smiling at an ice cream parlor – would be larger. Now, I understand they had space limitations, but a good photo editor would have been able to delete the space between him and his younger children and crop the edges of the picture some more and thus be able to make their faces more prominent (remember those older people with bad eyesight). On the plus side, the picture is wonderful. It’s a perfect setting, it emphasizes the fact that he is a family man and his children and wife are just beautiful so it’s a pleasure to look at them (yeah, I think it’s horrible that beautiful people grab more attention, but it’s a fact of life). The other side of the mailer is OK. It has two pictures of him. A larger one with firefighters, which is good, and another one sitting with a bunch of kids – which, again, is too small for me to see without effort. He is smart and keeps to the rule of three, listing three accomplishments in which he bolds just a few words (so people can glance at them and get the point) and with less excessive text. I do think, however, that the font should have been darker and the margins had a brighter color that would draw me more to that side. Content wise, one of his three points wasn’t clearly linked to his work as Vice Mayor and showed benefits for people beyond his current stakeholders. I am curious to see if anyone is interested on this type of campaign analysis, so I would appreciate if you let me know by commenting, or at least “liking” or “sharing” this article on Facebook. Thanks! Assembly Candidate Mixes Smarts with Diversity but will he be swallowed by the political machine? I like Rob Bonta. Indeed, I think it would be hard not to like him. He’s affable, he is smart yet low key, he seems committed to his family and California. I can see him going far, though that may be wishful thinking. And he is still untested – I’m not one of those who believe that city politics really prepare you for state or national politics -, right now he seems to be listening more than he’s talking, but that can be a good thing. 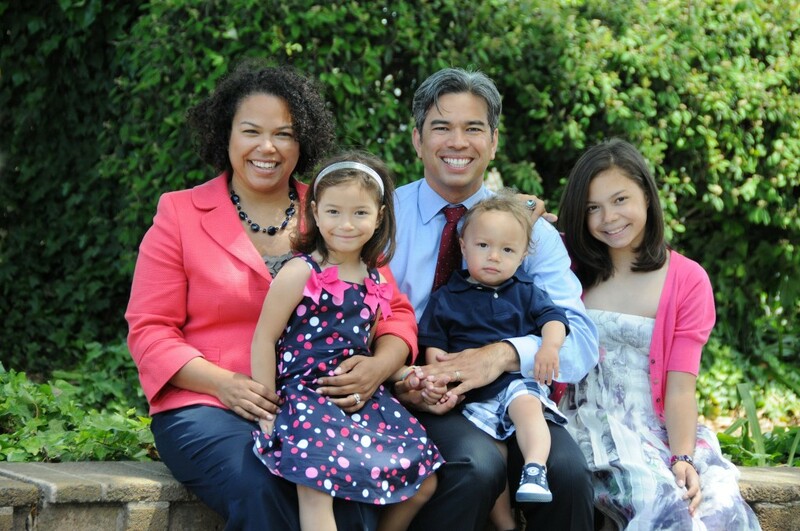 Rob Bonta, his wife Mialisa and three children. I will confess that one of the things I like most about Rob is his family. It really represents the face of America. Rob himself is of mixed Filipino and white heritage and he’s married to a Puerto Rican woman of mixed African, indigenous and Spanish blood. They have three children who attend public schools in Alameda. Though they are both Yale-educated lawyers, they have not pursued highly paid careers. Rob is a Deputy City Attorney in San Francisco, while his wife Mialisa is a consultant with a non-profit education organization. That means that they and their children face the same financial problems than most of us Californians do. Issues of public school funding, paying for college, health care and so forth touch them personally. I think that’s an important consideration in choosing representatives. But having a nice family is just icing on the cake; what I most like about Rob is his brain. Last year, Mike and I met with Rob for a couple of hours to ask him about his race and pose all sorts of questions. I was blown away both by his analytical skills and his honesty. Seldom he gave me the answer I was looking for, even when I telegraphed quite clearly what I wanted to hear. Instead he answered my questions carefully by identifying all the issues at play (even those that were not so obvious), and considering the implications of each course of action. Some of the issues we brought up were new to him so he wasn’t prepared to give us a concrete answer but hearing his thought process makes me confident that he will not rush into any policy decision and that he will be able to foresee the not-so-evident consequences of any position he takes. Almost as importantly, I am confident that any legislation that Rob drafts (and hopefully votes for) will be well written. One of the great problems with our justice system is that so many of our laws are very poor: unclear, contradictory, too complex to handle. I think the state could save millions of dollars by just passing well drafted laws that do not need to be constantly litigated. Politically, I see Rob as a middle-of-the-road Bay Area progressive. I think he will pursue progressive causes – in particular vis a vis education and social justice -, but my feeling is that he will be pragmatic and perhaps more willing to compromise than Guillen. I also don’t see him as being much of a “leader” – I think we can rely on him for sound legislation but I would not expect many a fiery speech. One thing that concerns me about Bonta is his political future. I think he has the “goods” to make it far in the political world. I see him moving into the governor’s mansion (or is it an apartment now?) or even the White House one day. He has the ambition to do it. But there are both pluses and minuses about having long term political expectations. On the one hand, the promise of a political future may work to keep Bonta more accountable to his constituency and more “clean”. On the other, campaigns are expensive and money is not free. Any candidate who is thinking long term, needs to think about who will fund his future political campaigns – and when it comes time to vote, it’s hard to do the right thing when it means having an empty campaign bank account next time around. To his credit, Bonta is very cognizant of this fact. When I discussed the issue with him, he didn’t insult my intelligence by feeding me the “they’ll support me because they support my positions” line which so many candidates use. Instead, he seemed very aware and troubled by what these future fundraising needs would mean for him. I appreciate that immensely, I think that the most important skill a politician can have is self-awareness. I have co-endorsed Rob Bonta and Abel Guillen, I think both of them bring different things to the table and I wish we could send them both to Sacramento. Rob is the favorite right now, but we still have a few weeks before June. Who are they and who you should vote for. Any day now, Californian absentee voters will be receiving their mail-in ballots for the June 2012 primary elections. For years, San Leandro was part of Assembly, Senate and Congressional districts which included our neighbors to the south and east. Redistricting has changed all that and we now join Alameda and Oakland in a district in which San Leandro has comparably little influence. It’s thus not surprising that there are no San Leandrans running for state or national office this time around. As of this year, Barbara Lee will represent us in Congress and Loni Hancock in the California Senate (both need to be re-elected but neither has serious competition). The 18th District Assembly seat, however, will become vacant because of term limits. Three candidates – two from Oakland and one from Alameda – are vying for it. During the last several months I have met and talked extensively with each of the candidates. I have also heard them at different fora. Based on what I learned, I have endorsed both Rob Bonta and Abel Guillen. I’m not usually a fan of dual endorsements, but both these candidates have a lot to offer, in different ways: both are smart and dedicated, but while I see Rob being more methodical and better able to write good legislation, I like Abel’s passion and I think he is more likely to stay true to his progressive ideals. The third candidate, Joel Young, in my opinion lacks gravitas and seems to have impulse control issues that would not make him a good legislator. I have written my impressions of each candidate individually. 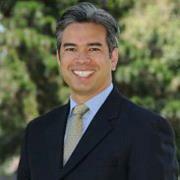 Rob Bonta is a Yale educated lawyer and a family man. He is very smart, a quick thinker and able to see the potential consequences of particular legislative decisions. I think he will be an excellent legislator – I also think he’s smart enough to recognize the perils of the political process and hopefully ethical enough to navigate around them. If elected, I see Bonta having the potential to go all the way to the Governor’s mansion (or is it an apartment now?) and even the White House. Bonta seems to be the front runner so far. Abel Guillen is the son of Mexican immigrants, a dishwasher and a cook and grew up in the Mission. He is the American success story, through commitment and hard work he got into Berkeley with the goal of “doing good, but also doing well”. As the VP of a school finance firm, he will be able to navigate the State budget better than most and he has creative ideas about how to improve the economy – including the creation of a state bank – that merit consideration. Guillen’s biggest strength, however, is his commitment to the community and his passion for achieving positive change. He has a broad base of support, including nurses and teachers. 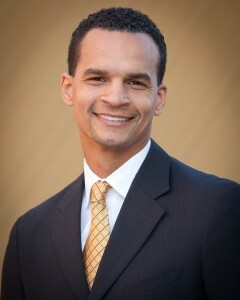 Joel Young is an African American attorney and also a Berkeley graduate. He is running on a platform of “jobs, jobs, jobs” but has little to say as to how to create them. Some personal scandals and his reaction towards them don’t speak well of his character. He is supported, however, by a significant segment of labor and the African American community.